Andrew and Amanda Kovanis of Nakid Imagination show off their wares. Amanda and Andrew Kovanis are young entrepreneurs in Bishop making—yes, actually making—clothing. Entrepreneurs Amanda and Andrew Kovanis look like they’d fit in more at Coachella than in downtown Bishop—They’re both 23 and hip, adorned with turquoise rings and impossibly good hair. They both talk over each other in the way newlyweds do, but their conversation revolves around the role of young artisans in an economy that’s arguably moving back, albeit at a glacial pace, from box stores to booths. 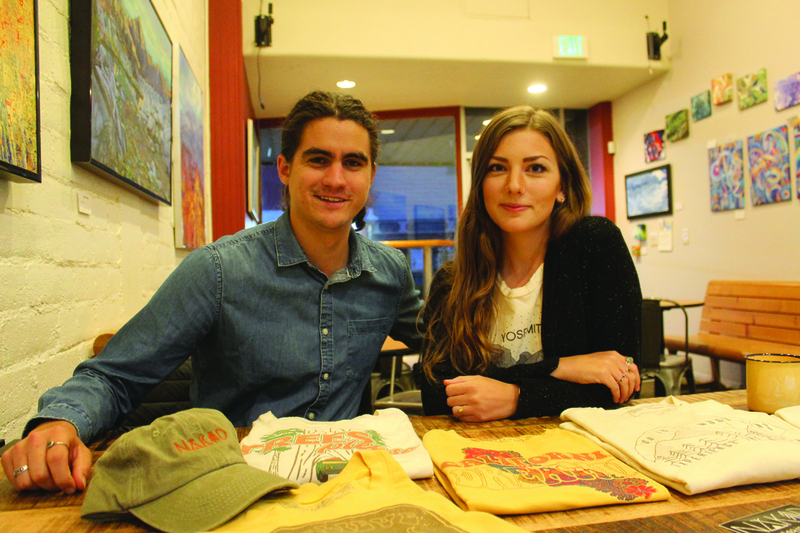 The couple are the co-owners of Nakid Imagination, a clothing company they started in their tiny apartment in Arcata, California. They now live in Bishop, and they’re part of a grassroots effort working to provide a space for creative types to showcase their goods locally. Amanda met The Sheet at Black Sheep Coffee on Tuesday, declining to give a tour of her home/factory until it was a little more under control (Nakid Imagination is doing a pop-up booth at the Holiday Bazaar at Bishop’s Tri-County fair on Saturday, December 2). Her husband, Andrew, strolled in after getting off work from his job as a GIS Specialist for Caltrans (and presumably snagging a coffee break before his second shift as t-shirt manufacturer). “We just want the clothes to embody the kind of lifestyle we live,” says Amanda. Their clothes are “for the restless souls who believe in taking road trips with no destination…” states their website. The Kovanises moved to Bishop about a year ago after Andrew was offered his job with Caltrans (he graduated from Humboldt state in 2016 and this was the first offer he got. After a visit to Bishop where the couple slept in their car, he took it). She started putting her design skills to work on clothing made by American Apparel while living in Arcata while Andrew was finishing college. The two launched a crowdfunding campaign on Kickstarter to get a boost for their company, took off for a backpacking trip to Europe, and realized halfway through that their campaign had exceeded their (modest) goals. Fulfilling their Kickstarter rewards (the couple offered clothing in exchange for financial support) was their first t-shirt blitz, but now the Kovanises are used to getting wholesale orders—and Amanda has upped the ante. She learned how to sew the shirts herself from bolts of American-grown cotton. “When I tell people I make the shirts, they don’t believe me. But, yeah, I make the actual shirts!” Amanda says. They also really like the idea of being a part of a revitalization of Bishop. They belong to a young entrepreneurs’ group that meets at Black Sheep. They spoke at the Bishop Town Council meeting on Monday, November 27 to express their idea that one of the vacant buildings in town could become something like a coworking space or market for makers to sell their wares. “I really didn’t think I was going to talk when we went” to the meeting, said Amanda. “They were talking about potential start-ups and nobody was representing that segment,” so she got up to share her ideas. He said that Nakid Imagination’s products (which also include some hats, mugs and stickers) are found at boutique shops across the state and even in Australia, and that having a place to sell their wares in Bishop would be huge for them. “It’s kind of weird we have more exposure outside of here,” says Andrew, who added that social media (Instagram, mostly) has been responsible for most of their wholesale orders. Nakid Imagination will be opening a pop-up booth at the Holiday Craft Bazaar at the Bishop Tri-County Fairgrounds on Saturday, December 2 from 9 a.m.-2 p.m. Check out their website at www.nakidimagination.com.